The model of the four parallel process levels is central to the Odyssey consulting framework. It captures the multifaceted nature of a consultant’s journey while at the same time mirroring the four dimensions of the human being: the physical, the intellectual, the emotional, and the spiritual. You must attain sufficient experience and requisite skills at each level to generate the momentum to progress to the next level. The Odyssey Arrow is a visual representation of the path to the ultimate Odyssey goal, which is to engage with your Ideal Clients on key assignments to deliver superb value and produce masterful results. Are you interested in being a professionally Certified Consultant? Take the journey to becoming a leading edge Master Practitioner. Learn to transfer best practise theory, process and methodology to build, grow and transform YOU and your consulting business. 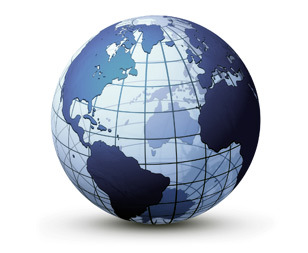 Do you want to make a world of difference for you and your clients? 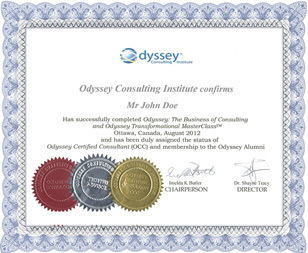 We invite you to become an Odyssey Certified Consultant (OCC). We certify you to become a professional using proven proprietary Odyssey methodology and processes. Odyssey Trusted Advisors earn more money, attract better quality clients, create successful consulting businesses and have more free time. 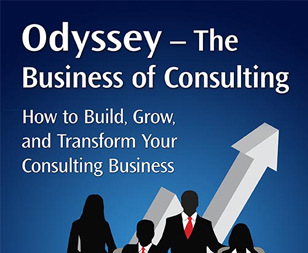 The strategy for Odyssey Consulting Institute is to create Odyssey Hub Masters globally who teach, train, integrate and implement the Odyssey-Business of Consulting solutions and processes with consultants in their regions and markets. Hub Master Agreements are created with interested, competent parties globally who deliver Odyssey-The Business of Consulting System to their clients locally and applying, modifying and customizing the "System" to accommodate best practice requirements for local markets. Why Do Some Consultants Generate Big Revenues and High Fees, while many others do not? How to drive your consulting business upward!